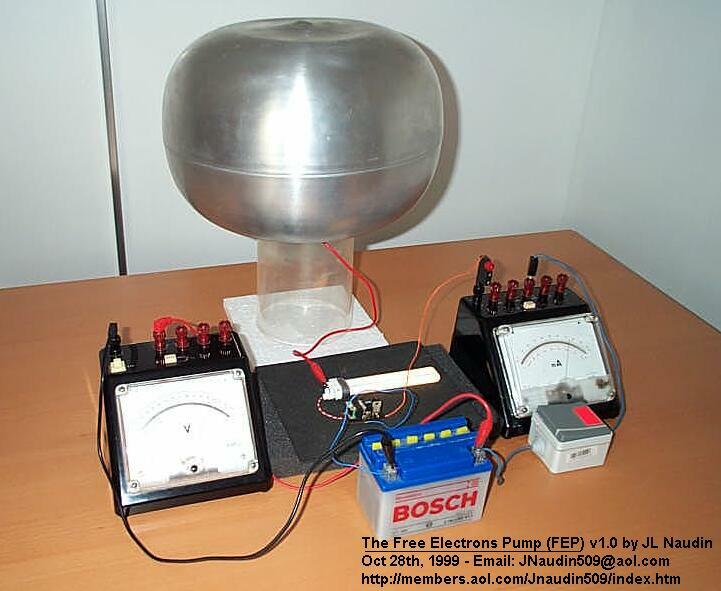 This device is based on the Stefan Hartmann's experiment released on October 26th, 1999 : "The Electron Pumping FL tube light". 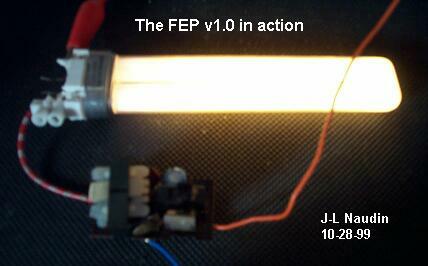 The FEP v1.0 is an enhanced version which uses a spherical capacitor coupled with the earth atmosphere. As Nikola Tesla had used in the Power Wave experiment in Colorado springs in June 26, 1899 and also during his tests of the first models of the Tesla Magnifier Amplifier tower , the FEP v1.0 uses the same principle for sucking free electrons from the atmosphere : " To produce an electrical movement of the required magnitude it is desirable to charge the terminal as highly as possible, for while a great quantity of electricity may also be displaced by a large capacity charged to low pressure, there are disavantages met with in many cases when the former is made too large. The chief of theses are due to the fact that an increase of the capacity entails a lowering of the frequency impulses or discharges and diminution of energy of vibration....." ( Tesla US Patent number 1,119,736 : "Apparatus for transmitting electrical energy" (issued Dec. 1, 1914) ). 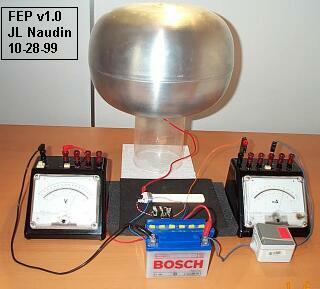 The FEP v1.0 uses a spherical capacitor made with an aluminum hollow sphere ( 365 mm diam. and 240 mm height ). 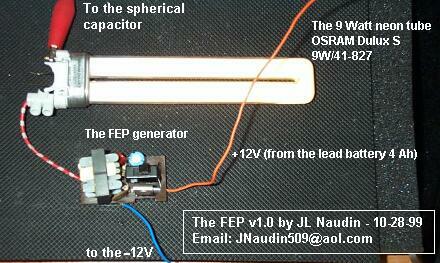 A 9 Watt neon tube (OSRAM 9W/Dulux S 41/82) is connected between the FEP generator and the aluminum sphere. 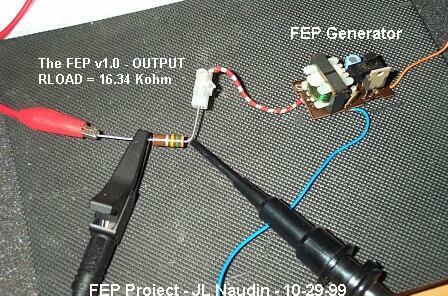 The FEP generator is a High Voltage Pulses generator which produces 1380 V pulses at about 29 kHz (see below). The FEP transformer (L1,L2,L3) is a high frequency transformer (with ferrite core) which can be found in common portable neon lights (used for camping). But you can also use L1 (7 turns of 4/10mm), L2 ( 6 turns of 5/10 ), L3 ( 750 turns of 1/10 ) wound on a ferrite core 10mm diam. If you find a ready made ferrite HF transformer, this will be better. The 9W neon tube is a common low consumption light tube, but I have removed its original starter circuit. The FEP Generator MUST BE powered by a battery source ( I have used a 12V 4 Ah lead acid battery) and MUST NOT BE GROUNDED. This is very important, because the system MUST BE OPEN. 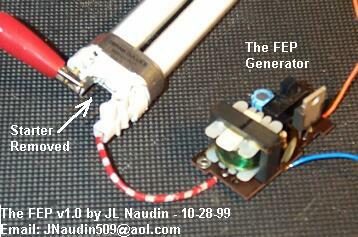 If you ground the FEP generator circuit, you build a common closed system and free electrons can't be tapped. So, when the power is switched on WITHOUT the neon tube ( with the FEP output left opened ), the power input required for the functionning of the FEP circuit is 5.17 Watt (11.5 Volt and 450 mA DC input )(see below). Note : If you don't have an aluminum spherical capacitor, you may also use a big aluminum sheet as a free electrons collector. I have used a Textronix THS720P isolated and ungrounded channels oscilloscope for measuring the voltage accross the output resistor. The RMS and PEAK output voltages has been computerized automaticaly by the scope. As you may notice in the diagram above, the measured output power accross the resistor was 801 mW RMS for 8.6 Watt Peak, the most interesting thing to observe is that THE INPUT POWER DROPS of 226 mW while 801 mW is generated at the output. 5) Theory of Wireless Power, By Eric Dollard, B.S.R.A. 1986.